Here are some pointers to include in your post. Best to Put the vital information in the post title. ie if it's urgent, for example, 'cause there's a difference between "Cat needs home" and "URGENT: 12-14 yr old FIV+ near Leeds in danger of PTS"
Get as much info into the title as you can. In the main post, please give us as much information as possible - making sure to be very honest about the details of their character, preferences, health, etc. as that will go a long way to ensuring the cat goes to the right home for their needs. Here are some points to consider in your post.  Your name and contact details. Please bare in mind this is a public forum so not wise to leave contact details in the post - If you are not a Purrs regular, please send an admin or moderator an email address or a phone number by private message.  Where about you live and where the cat/s are if the location is different.  Posting photographs really do help.  Cats general health or special needs (such as diet). Please be honest!  Character of the cat, is puss a lap, nervous, timid or an independent soul? What puss likes and dislikes.  If more then one cat do they need to be rehomed together or on their own?  Does puss get on well or been living with children (if so what age range) other cats or dogs?  Is puss an indoor or an outdoor cat? Extra info is especially important if the cat in question is a 'specialist' puss - a recognised breed, FIV or FeLV+, very old or very young, feral, medical needs etc as this could mean that s/he is particularly (un)suitable for certain potential rescuers. 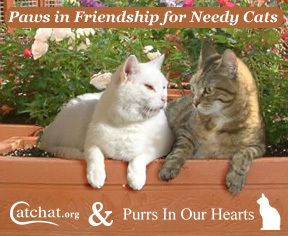 If you're not a Purrs In Our Hearts regular - please leave us some other way to contact you by sending an admin or moderator an email address or a phone number by private message, it can difficult if there's an urgent message and the only way of getting in touch is leaving messages for say "LuvzCatz" on a thread. With urgent cases, we can help further by placing a news item on the main page with a picture, If you would like this, please contact admin on email Purrs@purrsinourhearts.co.uk. Please be aware - re Private rehoming we don't allow cats to be "sold" for personal gain but we do allow cats to be rehomed in return for donations to cat rescues from the adoptee. Pet ownership is a privilege and requires a committed owner. "Free to a good home" rehoming can encourage casual cat owners who don't take it seriously. A new family's willingness to pay a donation to a cat rescue helps to demonstrate that they're financially able and willing to provide proper care for your cat. Best of luck with all rehoming needs, we will try to help all we can.